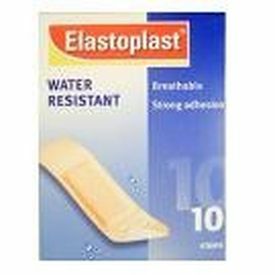 Elastoplast Water Resistant Plasters provide reliable adhesion and protection when bathing or swimming and promotes quick healing. Elastoplast Water Resistant Plasters provide reliable adhesion and protection when bathing or swimming and promotes quick healing. The plaster come on a non-stick pad which protects and cushions the wound and the strong adhesion seals around the wound and prevents dirt contamination.